As a growing photo booth and event entertainment franchise company, we’ve seen first-hand that franchising is a great fit for millennials. We’re especially proud to have many talented and driven young franchise owners—many of whom have built and continue to build successful businesses— as a part of our team. If you’re a young adult who’s exploring career options or thinking about starting a business, add franchising to the list! Not only are there a number of affordable franchise opportunities, there are many notable benefits of franchising too. Take a look! One of the biggest benefits of franchising is the support that comes along with it. 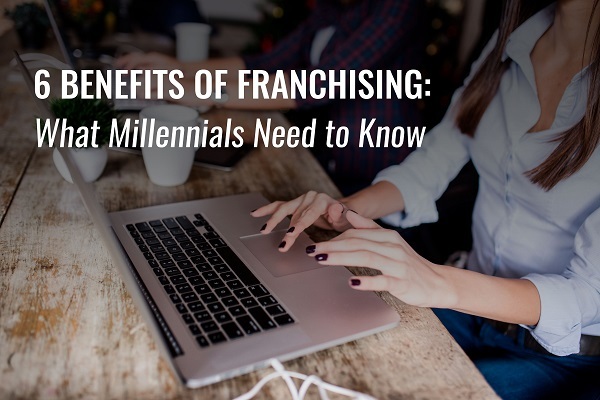 Most well-established franchises offer training and ongoing support in areas like sales, marketing, and tech support (considering the franchise is technology-based). Good franchisors will also ensure that you have all the tools to hit the ground running and will work with you to help you build a successful franchise business. Aside from the franchisor’s support, you’ll also have a vast network comprising of other franchise partners to tap into. Think of it as a community of mentors! When starting your own business, there are many things you need think of. Branding, marketing, building a client list, and finding a location (depending on the type of franchise) are just a few. However, when buying a franchise business, you’ll have fewer things to tackle when starting up which gives you time to focus on other, more important things. The franchisor will also typically be involved with product development or market research to help you stay ahead of competitors in the industry, which means there’s one less thing for you to worry about. While franchising doesn’t come without risks, there are far fewer of them than going it on your own. One of the benefits of franchising is that it’s based on a proven business model. That means other franchisees within the business have found success. Franchising is also a great way to build equity. So, even if you need to exit the franchise one day, you’ll be able to sell your business at a profit. Simply put, franchising can be a great investment if you pick the right business. Remember, you’ll get back what you put into it; so, with a bit of elbow grease, you’ll definitely see a return. If you’re thinking about franchising with TapSnap, estimate your return with our ROI calculator. Buying a franchise business sounds like an expensive venture. However, the truth is there are many affordable franchise opportunities out there. It’s also easier to secure financing for a franchise business as opposed to other small business opportunities. When narrowing down your options, also take into consideration if the franchise is SBA-approved. It’ll help you obtain financing without having to jump through many hoops. Thinking of buying into our franchise? Here are a few options on how to finance your TapSnap franchise. If a 9 to 5 job doesn’t appeal to you, franchising might be a better fit. As your own boss, you can set your own hours, giving you more flexibility and control where your schedule is concerned. One of the added benefits of franchising with TapSnap is that you also have the option of starting part-time. This allows you to keep your day job as a safety net until you’re ready to manage your business on a full-time basis. Like any other business venture, most franchise businesses have plenty of room for growth. You’ll especially be at an advantage since you’ll have a well-known brand name behind your business. At TapSnap, many of our franchise partners have successfully grown their small, part-time businesses to large, full-time operations. Not only do they continue to grow financially, they’re building their own teams and culture along with it. While these are just a few benefits of franchising, the list does go on. For more insight, take a look at this expert franchise advice by ZorSource’s Franchise Department Director! If you’re looking for affordable franchise opportunities, consider TapSnap. You can get started for less than $60,000! For more information, check out our no-obligation Franchise Information Report, or leave your questions in the comments section below.